You can read an update of what happened during 2018 here. Amazing! We will keep in touch. Amazing! What are you interested in? What video frequency would you like to use? What input devices would you like to use? How would you like to display the video at the receiver? How far away are you interested in flying? What latency is acceptable for your application? What do you usually fly? After two and a half years in development we can't claim to be the first to market, but we are sure there are a few things in here you might find interesting. Ours is a digital FPV product providing a crystal clear 720p video feed with latency and range of analog FPV systems. 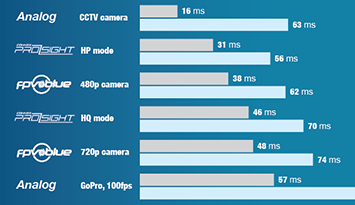 Depending on your application video latency might be very important to you. Out of the box glass to glass latency when using our proprietary camera is in the 50 milliseconds range. There are additional options lowering this further to around 40 milliseconds, without sacrificing video quality, depending on your monitor. 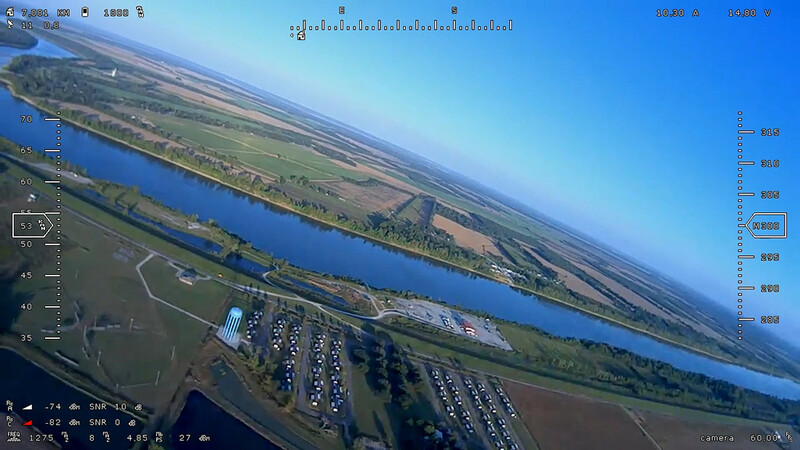 The picture above is a downsampled screenshot of fpv.blue's live output while flying seven kilometres away with 27 dBm (500mW) of transmission power. A 8 dB patch was receiving the signal, while the 2 dB omnidirectional antenna connected to the diversity receiver lost signal when around 2-3 kilometres away. 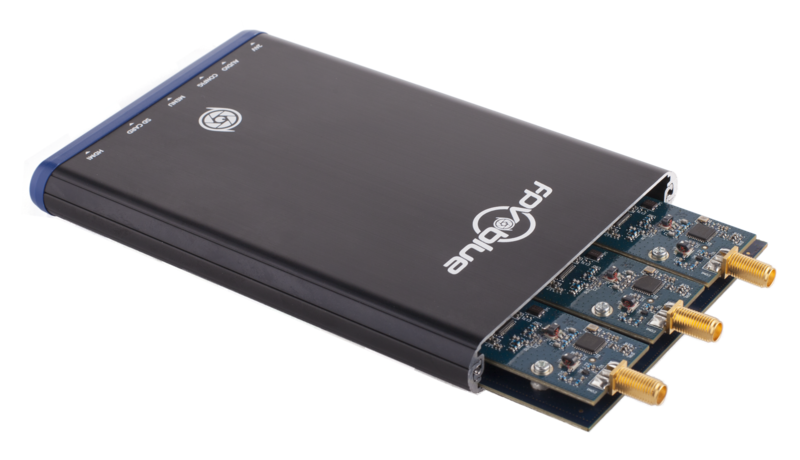 We have additional options allowing you to lower video quality and RF bandwidth with the flip of a switch on your RC radio, increasing power spectral density, receiver sensitivity, etc., to reach even further. 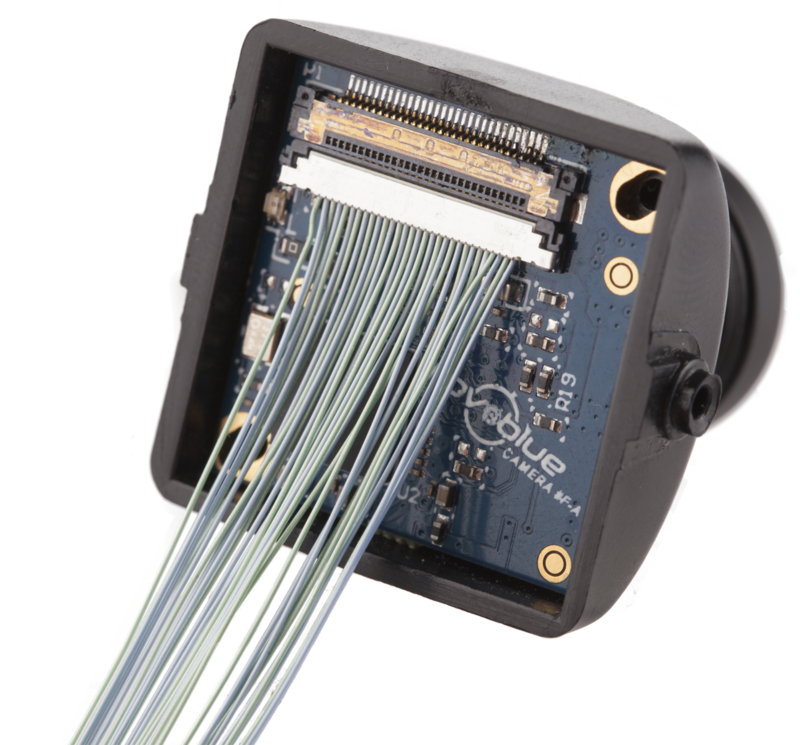 We selected a top of the range camera sensor, an AR0132, along with it's AP0100 ISP companion chip to provide the best 720p video quality possible. We then went to great lengths to ensure the camera board was super small, fitting in a standard 25 millimetres FPV camera enclosure, with very flexible cabling to allow it to be mounted on a typical pan and tilt. The camera supports HDR and resizing the full sensor (1280x960) to 720p, options you can enable via software. Unsatisfied? There is a HDMI micro video input onboard. Connect both and switch between video inputs from your RC radio! We have working prototypes for 900 MHz, 1.2 GHz and 2.4 GHz RF modules. Yes, modules. Want to change frequency? Broke something in a crash? Replace your RF modules! The picture shows transmitter RF modules prototypes for 900 MHz and 1.2 GHz. Please note that the first hardware batch is planned on supporting 1.2 GHz ONLY and that availability of 900 MHz modules will depend on customer interest. You probably don't need a diversity receiver, so we are keeping costs down by shipping without one by default. You can, however, purchase additional receiver boards. Every receiver board provides a completely independent RF demodulation path, so you might want to attach them to different antennas. Want to keep in touch? Just subscribe to the newsletter. You can order today, visit our blog, follow us on facebook or send us an .